In October you will mostly find us carving pumpkins! 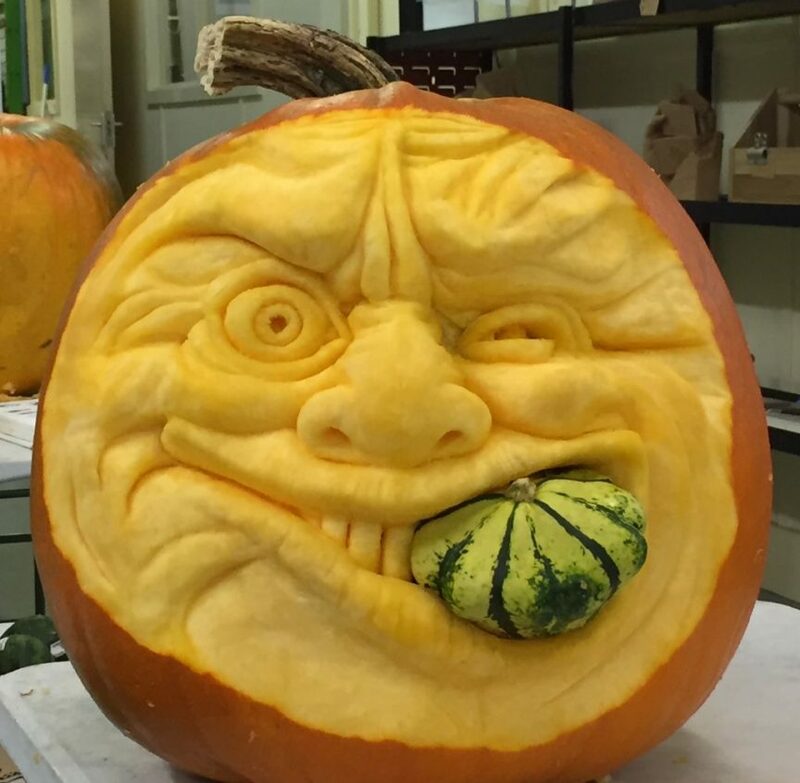 Everybody seems to want a professional pumpkin carving for their Halloween party or event, so the whole Sand In Your Eye team gets involved with making spooky and funny 3D pumpkins or stenciled faces or logos that glow. We were pleased to invite back to our Yorkshire studio, our old friend Andy Moss, who was a lynchpin of Sand In Your Eye in earlier days and is still a dab hand at sculpting sand, ice and pumpkins. Woodford Investment Management Ltd wanted a suitably gruesome Halloween pumpkin to sit on their reception desk and welcome their clients to their offices in Swindon. The pumpkin would have a cheeky twist, it would be chomping down on another smaller squash! If it’s a vegetable eating a vegetable is it cannibalism?? We’re not sure. Andy carved the pumpkin in our studio, keeping all the mess up in Yorkshire and then it was safely wrapped up and couriered down to Swindon overnight so it arrived nice and fresh, giving their office a festive Halloween atmosphere. We provide care tips with each pumpkin we carve, but if you have one it is easy to keep it in good shape for up to 7 days. Keep your Halloween pumpkin out of draughts and away from heaters or radiators, keep it out of strong sunlight or from under powerful lighting. These will dry it out and the flesh can tear easily. Look out for spots of mould developing. To try and prevent mould, spray the flesh with a mild detergent or bleach solution. If possible, when it is not on display, wrap in cling film and put it in the fridge – it’s like any vegetable, once you cut into it, it will start to go off! We think you will agree, Andy’s fantastic pumpkin carving skills gave this gory scene a sense of humour and style and the team at Woodford were thrilled with it.